Discussion in 'Tips and Technical Info posted by Technician's' started by BrooklynBay, August 17, 2007. 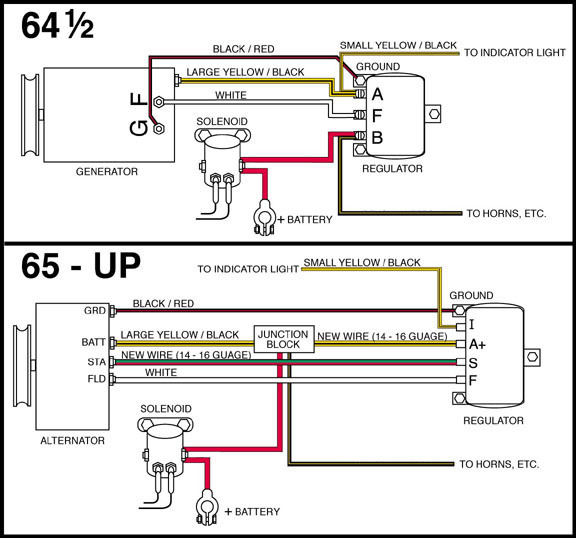 Alternators, and starters are generally pull, and replace kind of parts. Lets take a look at what makes alternators work (or not work). 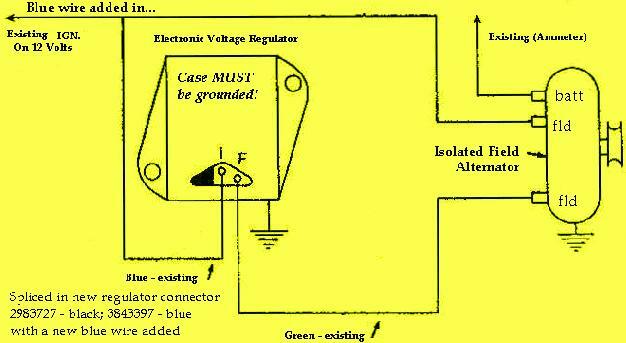 Voltage from an alternator must be regulated in order to maintain a constant voltage. Passive voltage regulators such as the one in this picture only have an upper voltage limit. They will only let the voltage go up to a predetermined threshold point, but will not regulate voltage when it drops. It will act like an electronic switch which applies full power to the rotor. It could only put out as much as is coming in. A weak battery will not apply enough voltage to step itself up. An active regulator will step voltage up while reducing current. This kind of regulator regulates voltage when it increases (sources), and when it drops (sinks). Computer power supplies use a similar kind of regulator as the one just mentioned (PWM or pulse width modulation). The internal regulator in this alternator is called a linear regulator. Some systems use negative voltage regulation while other systems use positive voltage regulation. The regulator makes contact with the rotor through brushes. The rotor has an assembly around it which works in a similar fashion as a transformer. It is called the stator. It does not move like the rotor. Now that this is explained, lets discuss the common problems with alternators. The carbon brushes on the top have gotten "shaved or sculpted" into the shape of the rotor's commutators (copper contacts in the rear). Brake pads, steering column clockspring contacts, horn contacts in older vehicles, and clutches, get worn down with use. A smaller pulley will turn faster, and wear the brushes down faster. The advantage to the smaller pulley is that it allows the alternator to turn faster at idle. This helps maintain a constant voltage since the alternator is designed to operate at a minimum RPM rating. Some alternators will have problems maintaining the proper voltage at idle if the RPMs are a drop too low. There is a fan in the front on the older alternators to cool them down. The newer ones have an internal fan blade. Some alternators such as the one in this thread (on my 89 Aerostar) with the internal regulator are negative regulators. 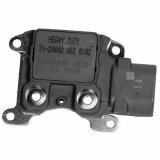 Older Chrysler alternators with the external regulators were also negative regulators. Internal regulators have a problem coping with the heat of the engine. Their output decreases a little with temperature. I have a set up on my 88 with an external Chrysler regulator mounted a distance away from the alternator in a some what cool spot. This is wired directly to the internal regulator to work in parallel. When the internal regulator decreases its output, the external regulator maintains a constant charge rate. 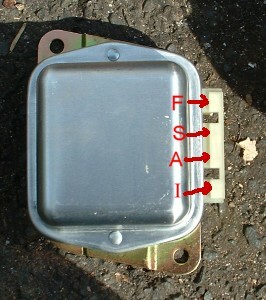 The older Fords had a positive external regulator, such as the type used on an 89 Mercury Sable. 1. Check for continuity on the rotor. No continuity could be the result of a blown rotor or bad brushes. 2. Broken wires or rusted connections. 3. Defective battery not holding a charge. Corroded battery contacts or bad battery cables. 5. Defective regulator or diode trio. 1. Shorted or blown diode(s). 3. Under rated alternator with multiple high current assessories running simultaneously (extra lights, winch, stereo system, etc). 5. Improper pulley size causing it to turn too slowly. This is only an issue when using other underdrive/overdrive pulleys. Additional links for further reading. Article about alternators in the April 2009 issue of WWW.GearsMagazine.Com. Very useful information. Like you say it appears most people pull and replace alternators rather than replace. I've been around long enough to remember "generators" and replacing brushes on them. It would be interesting to know how many alternators with internal voltage regulators are replaced when the brushes and/or the regulator are the problem and could be replaced much cheaper. I guess only a rebuilder would the only one to have a handle on that information. Welcome to this forum! If you have an old generator you would like to rebuild, could you make a similar how to thread on it? It would be a companion thread to this one. I know that old systems ran on 6 volts before they started to use 12 volts as a standard. There was a lot of talk about 42 volt systems a few years ago, but it looks like 12 volts will remain the standard for a while. Sorry, I don't have any generators to rebuild. I used to rebuild VW air-cooled beetles and they used generators until 1974 if I remember correctly. They used 6-volt until 1967 when they went to twelve volts. I will see if I have any literature on rebuilding generator that might be useful to post. It might take me awhile. I think you meant to say 24 volts for a new standard. I'd heard that too. Some alternators such as the one in this thread (on my 89 Aerostar) with the internal regulator are negative regulators. 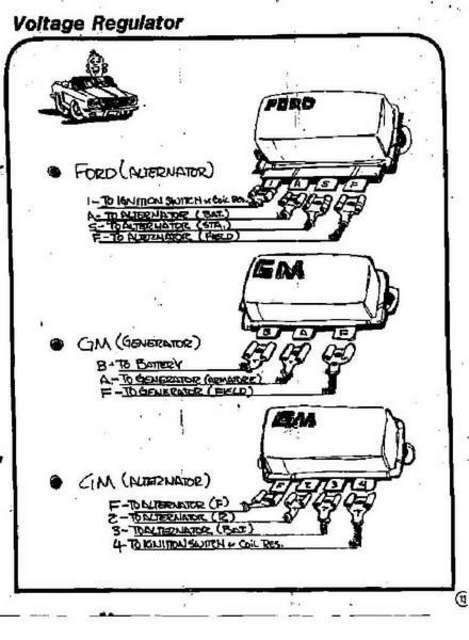 Older Chrysler alternators with the external regulators were also negative regulators. Internal regulators have a problem coping with the heat of the engine. Their output decreases a little with temperature. I have a set up on my 88 with an external Chrysler regulator mounted a distance away from the alternator in a some what cool spot. This is wired directly to the internal regulator to work in parallel. When the internal regulator decreases its output, the external regulator maintains a constant charge rate. 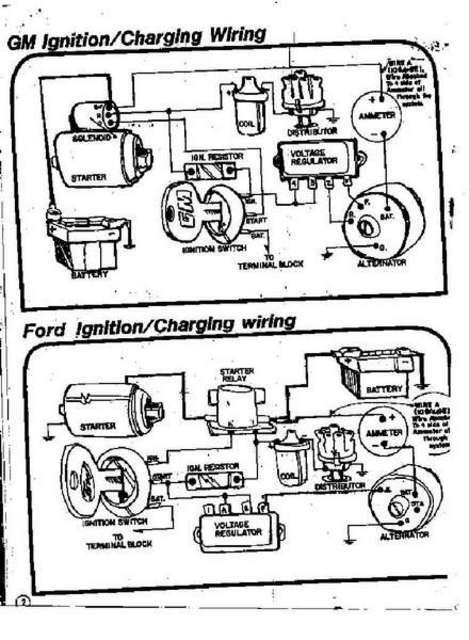 The older Fords had a positive external regulator, such as the the type used on an 89 Mercury Sable. This is a very informative thread. When I had all my fox chassis mustangs I always just rebuild the alt instead for replacing it. Its much cheaper. Now I have a 01 Explorer Sport and just had t o replace the alt. I couldnt find a rebuild kit for it. Every where I called said they dont make one. Do you know if there is a kit on the market to rebuild the newer alternators? Check WWW.Alternatorparts.Com. You could buy individual parts such as brushes or regulators from WWW.Autozone.Com or WWW.Rockauto.Com. Ok techies... Here's a question you all may or may not know the answer to. I need a high output alternator for my truck. I have a nice aftermarket stereo system which requires a 200 amp alternator. My stock 95 amp just isn't good enough. Is there an easy way to rebuild my factory so that it puts out 200 amps? Like replacing a part? I just can't see spendin between $200 - $500 on a H/O Alternator. Thanks in advance! You could put the same parts into your alternator that the high output alternators have. I don't know how much you will save since high performance parts are very expensive compared to the stock parts. I just paid about $200 for a 200 amp alternator, plus powder coating. The OHV 4.0 alternators are most common on eBay, about the same $200. I think my alternator is going bad. However, when I disconnect the battery while the engine is running, it sill runs. But the car loses power, like the tachometer loses power when I rev the engine, etc. So I guess I'm in the "low charge" area right now. So from the above, are you saying that it's definitely either the regulator or diode? Is there a way I could check these? Where is the diode again? Al may still have his used alternator, and they are fairly reliable. You need to connect a voltmeter across the battery, and see what the voltage is while it's running with all of your accessories turned on. Your battery or contacts might be bad, so clean the terminals before you test anything. You could load test the battery if you have the proper tool. Any auto parts store could do it for you if you don't have the equipment.